The cool evening of November 4th was dedicated to our veterans to bequeath respect and honor for their services to our country. 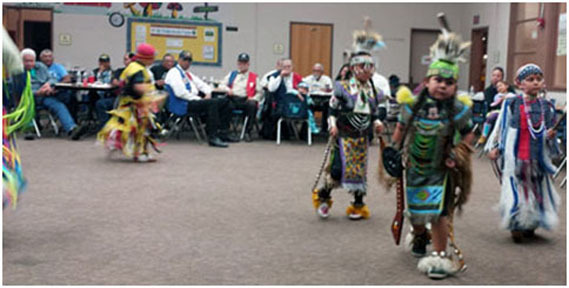 The Soaring Eagles welcomed our veterans in full regalia and honoring songs with a Grand Entry, most of the combined Color Guards of American Indian Veterans Association (AIVA) and American Indian Warriors Association (AIWA) are Gourd Dancers. Our drummers Mr. Terri Hensley and Mr. Richard De Crane are a couple of singers that provide the drum and songs for our Eagles dance sessions, a duly disposition and constant support that enables motivations for our program. American Indians served in the Revolutionary War and the Civil War. United States entered WWI in 1917, American Indians served in World War I as non-citizens, June 2, 1924 the Indian Citizen Act was passed by Congress. During WWII thousands of American Indians served; Ira Hamilton Hayes, Gila River Pima tribe, U.S. Marine, was one of the six flag raisers on Mount Suribachi on Iwo Jima, February 23, 1945. Buried with full military honors in Arlington National Cemetery, Washington, D.C. First American Indian Code Talkers from the Choctaw nation were used in WWI, in WWII the Navajo and Comanche language were used for military codes, other tribal languages used were Hopi, Meskwaki, Chippewa-Oneida. The Japanese never decoded the Navajo codes and the language was declassified in 1968. The Choctaw and Navajo Code Talkers' tribe finally received the Congressional Gold Medals, long after most of the members passed. During Operation Iraqi Freedom U.S. Army Pfc. Lori Ann Piestewa was killed in action March 23, 2003. A member of the Hopi tribe, Ms. Piestewa has a daughter and a son, daughter of a Vietnam veteran and granddaughter of WWI veteran. She is believed to be the first American Indian woman killed in combat in a foreign war, resided in Tuba City, Arizona, a peak in Phoenix was renamed in her honor. 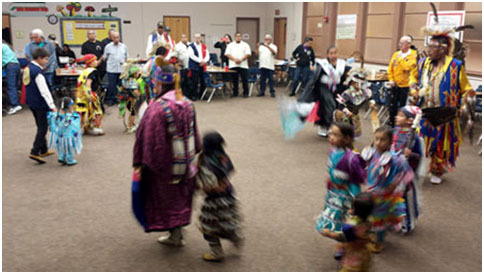 The essence of powwows and cultural presentations are the drum and songs; singers learn scores of songs that has become inter-tribal and categorical selections are protocols for specific dances. The realm of filtering knowledge and wisdom by our elders and veterans are exposure to adversities and experiences, resiliency in adaptation and interpretations for empowerment and self-esteem. The Soaring Eagles program explores its diverse program, academics is the bedrock for the foundation and partnership with other agencies aligns resources to be self-sufficient. 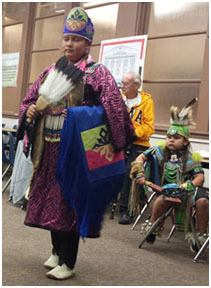 American Indian Veterans Association (AIVA) out of Orange County were the invited guests and lavished with praise and honor; including potluck food often prepared by Jennifer Garcia's family. Our aging veterans included Mr. Joseph Renteria, Cherokee, 98 years young, spry and a local resident who has had an impressive journey of life, the Circle of Life. He spent 3 years in the U.S. Army and re-enlisted in the U.S. Navy where he served 17 years. His impressive career in the U.S. Navy included photographing nuclear testing in the Pacific (WWII), and over a decade as Chairman/board member of the Indian Human Resource Center, Inc. Also noted by American Indian Veterans Association (AIVA), our elder, USMC veteran, actor, Mr. Saginaw Grant had medical procedure and slowly recovering in L.A. area. Our senior adviser and Spiritual elder Mr. Randy Edmonds, Kiowa/Caddo, advocate, activist, a Gourd Dancer has been instrumental as our representative for decades in urban San Diego American Indian community, he established networking and communication for resources for myriad of programs. The presentation at the Ballard Center were Grass Dancing, Chicken Dancing, Jingle Dress Dancing, Southern Tradition Dancing, and Fancy Shawl Dancing. Our pride and joy young Eagles performed well and applauded by our veterans and families. 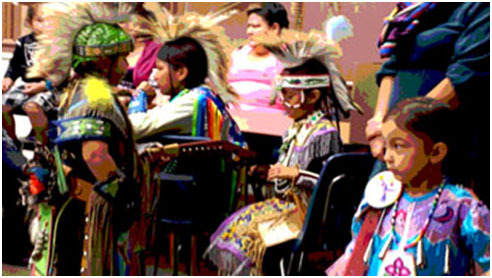 The collaborative coordination by the San Diego American Indian community enhance our programs, provide cultural enlightenment and visibility.